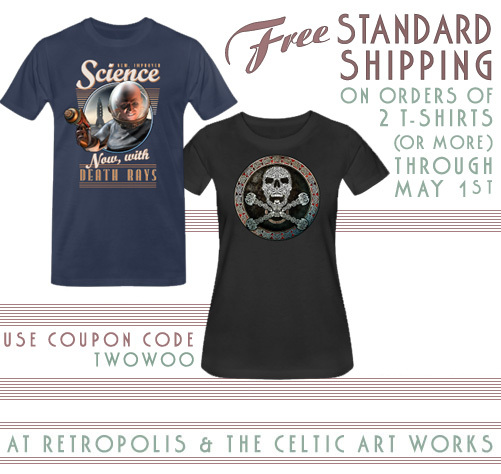 I guess things must be warming up outside the Secret Laboratory because through May 1st you can get free standard shipping on orders of two T-shirts or more from Retropolis and The Celtic Art Works. That usually doesn’t happen before the lawn needs to be mowed… hence my conclusion about the temperature. Maybe I’ll poke my head out the window and find out. Just use the super-secret coupon code TWOWOO when you check out. And you know what’s even more super-secret? You can do the same thing on T-shirt orders from the Pulp-O-Mizer. Preheat your cold war era oven to 350 degrees. Do yourself a favor by making the topping first. It’s easy: just chop the nuts and mix all the ingredients together. I always make more topping than this; you may find that you will, too. Cream the butter, sugar, and eggs. Add the baking powder and salt; cream it for a few more strokes. Spoon half the batter into a greased and floured bundt pan, about 10″ in size. Cover with half the topping. Add the rest of the batter, then the rest of the topping. Bake at 350 for 50 to 55 minutes. This cake is deceptive, as you’d expect from the product of espionage; because of the sour cream it will not seem to be baked through when you poke it with a toothpick. Some experimentation is required (and recommended). Cool the cake almost completely before removing it from the pan. Then sift powdered sugar on top. It’s all over but the eating. If you’ve been wondering what’s going on with Slaves of the Switchboard of Doom, well… so was I, for awhile. I thought I had reasonable expectations for how speedily the publishing industry moves. In this I was mistaken. But March and April have seen a sudden burst of activity, a new release date, and the slow transition from my recent no expectations to my current cautious reserve. The book’s new publication date – which I still consider a pleasant daydream – is March of 2017. That date is looking more likely these days because the sales department has taken an interest. At some point their interest will turn into intent, penetrating looks directed at any part of the book that isn’t moving toward the release date, and once those intent, penetrating looks start darting around I think we can be pretty confident about the date. Nobody wants to get looks like those. I’ve finished a couple of rough layouts for the book jacket and I expect I might start getting some looks of my own once everybody’s had a chance to see them. The dust jacket designs were a genuine blast to work on: they’re wraparound designs, so each one is a big picture that’s made up of five smaller rectangles that also need to work on their own. I really enjoyed working on them. No, you can’t see them. But I am looking at them while I’m typing – which is actually pretty difficult – and I can tell you that we’re probably going to have a pretty nice cover. In the meantime we can look forward to The Purloined Patents of Doctor Brackett, the serial that should start up in June at Thrilling Tales of the Downright Unusual. Purloined Patents will kick off a series of short serials that’ll run into February of next year. So there’s a lot to look forward to, in just a little while. 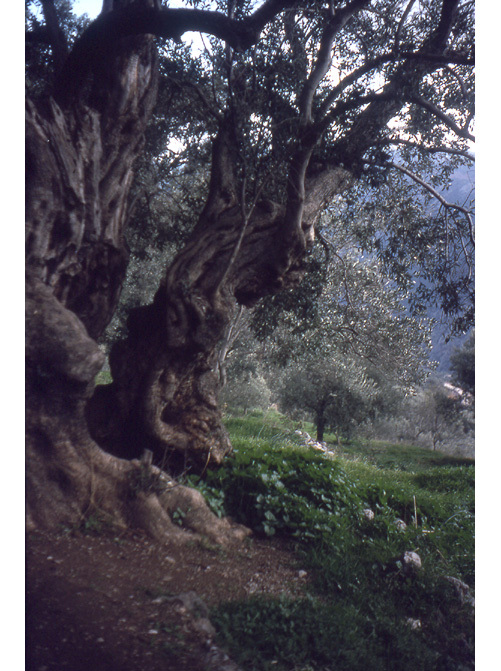 Back in 1979-80 I spent a winter in Greece. It was colder than you’d expect, but it was the cold of Sophocles. So not so bad. I was there on a grant from a Canadian foundation. The idea was that I would broaden my artistic horizons and paint, which was exactly what I wanted to do, and so it was a good deal for me. I’m not sure how they felt about it. So The Best Girlfriend In The World Except For That One Thing and I settled into a little house, which everybody called a villa, in a village called Pallini outside of Athens. Pallini had been there for a long time; in Roman times it was the site of a marble quarry, and there were odd bits of marble sculptures all over our house’s long, narrow, steeply sloping yard. An old marble cornice was our doorstop. We’d been warned to keep the yard’s gate locked “or the Gypsies will get in” so of course we never locked the gate, but the Gypsies never showed up. I’ve always wondered where they were. We made this house our base of operations. We’d explore Athens, and we’d take off for short trips to Delphi and the North, but we’d always have the villa when we were done. And it was a nice place. We’d spend an afternoon visiting the son of the local vineyard, or we’d take off into the hills outside the village, or we’d mock the village goats, who were asking for it. I’m pretty sure those trees up above were Pallini trees. So you can see it was a nice place to wander in. There came a day when The Best Girlfriend In The World Except For That One Thing and I headed up the road out of the village and into the hills, and we went in a direction we’d never taken before. I don’t know why. But there are a lot of directions, when you think about it, and for whatever reason we’d just never used this one. It led us through a little valley. There was a farm on one side of the valley, and somewhere on that farm there was a dog. We never saw it. We heard it, though: it was barking. The dog would bark, and a moment later the echo of its bark would bounce back from the other side of the valley. So the dog would bark again. And the The Best Girlfriend In The World Except For That One Thing and I just stood there and listened for awhile. Bark; pause; echo; bark; pause; echo. Again and again. We were witnesses to the ultimate straw man argument, in the ultimate echo chamber. Because that dog just couldn’t let Echo Dog have the last word. In a way I can’t quite explain, this was one of the most profound moments of my life. I had the sense that the Universe was explaining a mystery to us. And I think I was right. A few hours later, The Best Girlfriend In The World Except For That One Thing and I came back through the valley. The dog was still barking. And although I know that this dog lost his argument with Echo Dog many years ago, I hope that his descendants have taken up the feud and are still out there barking, refusing to let Echo Dog have the last word even though – inevitably – he will. I can’t guarantee what kind of sensation that is; and if it’s the sensation of clammy tentacles slithering into your ear, well, I refuse to take responsibility. That’s on the record. 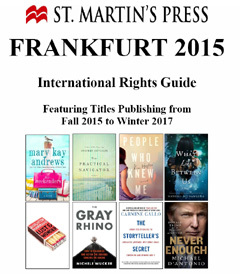 But I just ran across this announcement from the St. Martin’s Press catalog of upcoming titles. It delighted and surprised me, and I enjoyed that sensation. So maybe you will too. 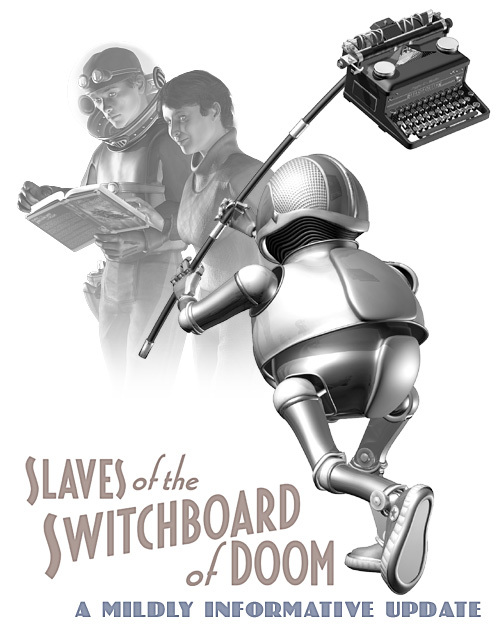 Slaves of the Switchboard of Doom is unlike anything else in genre fiction: a gonzo, totally bonkers vision of the future imagined in the 1939 World Fair—a hilarious, illustrated retro-futurist adventure by artist and debut novelist Bradley W. Schenck. This is classic Flash Gordon meets the Keystone Cops, a gut-busting look at the World of Tomorrow, populated with dashing, jet-packed heroes, faithful robot sidekicks, mad scientists, plucky rocket engineers, sassy switchboard operators, space pirates, bubble-helmeted canine companions, and more. Between you and me and the entire Internet, that’s not the release date; and when I did a quick count I came up a little short on jet-packed heroes, plucky rocket engineers, and bubble-helmeted canine companions – though maybe my editor wants to talk to me about them. Could be a subtle message. But despite those discrepancies, nice to see!